Officer K is the protagonist and new LAPD blade runner in the movie Blade Runner 2049. The movie is set thirty years after the events of the first film, in a society on the brink of chaos. Officer K aka Blade Runner is the protagonist in Blade Runner 2049. He unearths a long-buried secret that has the potential to plunge what's left of society into chaos. K's discovery leads him on a quest to find Rick Deckard (Harrison Ford), a former LAPD blade runner who has been missing for 30 years. 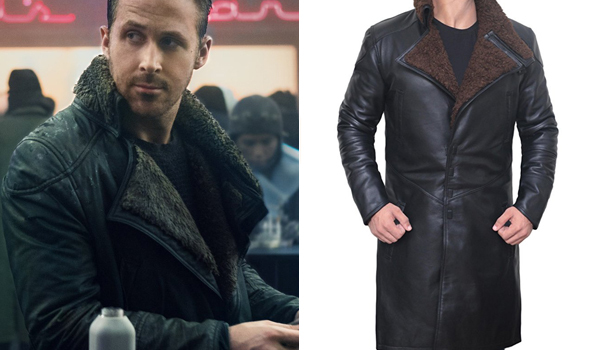 The coat that Ryan Gosling wears in Blade Runner 2049 for his Officer K is a very dark green painted cotton coat with a shearling collar. It is custom made by costume designer Renée April. However this is a great replica made with real leather where you can attach or detach the different parts of the collar just like in the movie. 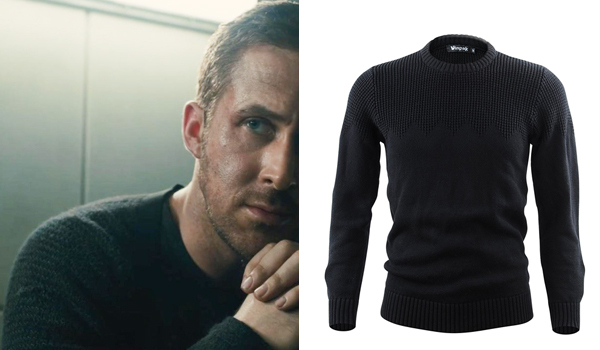 The shirt that Ryan Gosling wears in Blade Runner 2049 for his Officer K is a simple knitted long-sleeve black jumper. The Vinpak pullover is a pretty close match. He also wears a black shirt underneath. 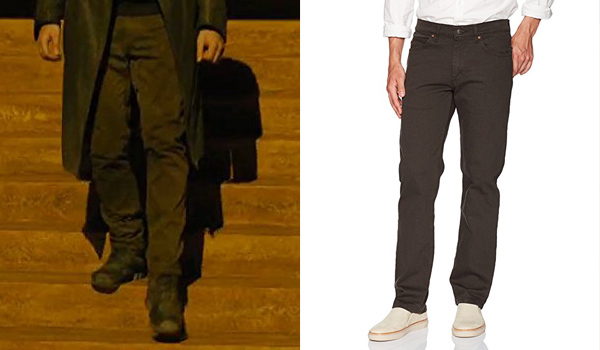 The pants that Ryan Gosling wears in Blade Runner 2049 for his Officer K are dark brown jeans with a straight cut. These Lee Tobacco Jeans are a very close match. 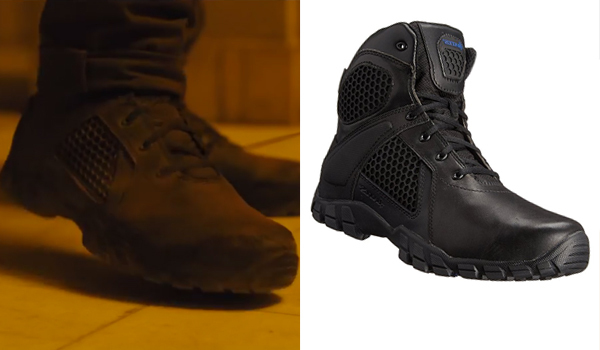 The pair of boots that Ryan Gosling wears in Blade Runner 2049 for his Officer K role are black tactical boots. They are Bates Strike Boots. 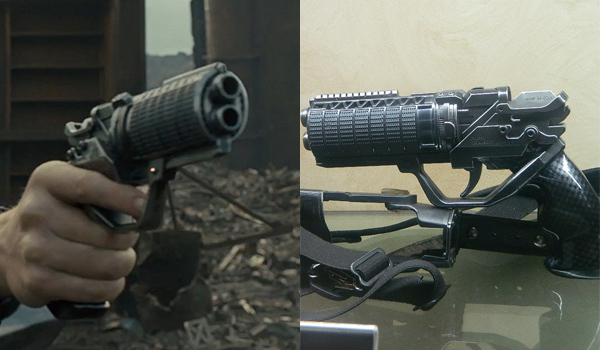 The gun that Ryan Gosling uses in Blade Runner 2049 for his Officer K role is a Blade Runner Blaster. Some replicas have been made by fans and are available on etsy. You can get either the 2049 version or Deckhard's one. How do you know that? Is he ever depicted unsleeving them from his pant leg? Thanks guys, I updated the link. Just watched the film for the second time and that coat isn’t leather. It looks like a waxed textile fabric. In the closeups, especially when its lying aroynd before he picks it up to put it on, you can actually see the weave and texture. Looks great in leather though, juat a shame all the commercially available versions don’t fasten up tight like his. The coat is a vegan coat and it won an award for that. So, very humbly I would like to say that you should have also included a link to vegan replica at least to maintain the authenticity at the very least (even though it’s a replica but it’s not made from leather). And also to have an option for the vegan fans who are looking for a replica. Also, some of the comments show that the vegan version would be more appreciable. I recently purchased a cotton replica and it’s the best in the market. If you would like I will share the images and link of that product. It’s awesome quality and fairly priced. It should benefit your readers. Sure, let us know !